Rabobank's Oscar Freire extended his lead in the green jersey race in the sweetest way possible, with a stage win at Digne les Bains. A late climb marooned 4-stage winner Mark Cavendish in a 2nd group, so his Team Columbia worked instead for Kim Kirchen, but to no avail. Erik Zabel was well-placed, following Marcus Burghardt into the final 300 meters, but when Freire got his cranks turning, he easily outdistanced Zabel and Leonardo Duque for his 4th career stage victory. Freire extended his green jersey lead, as Thor Hushovd could manage only 10th on the day. 3. Erik Zabel, Milram, Germany, s.t. 4. Julian Dean, Garmin-Chipotle, New Zealand, s.t. 5. Steven de Jongh, QuickStep, Netherlands, s.t. 6. Alessandro Ballan, Lampre, Italy, s.t. 7. Ruben Perez, Euskaltel-Euskadi, Spain, s.t. 8. Jerome Pineau, Bouygues Telecom, France, s.t. 9. Matteo Tossato, QuickStep, Italy, s.t. 10. Thor Hushovd, Credit Agricole, Norway, s.t. Overall standings are, once again, unchanged. That will probably change tomorrow. Team Columbia's Mark Cavendish continues to dominate the sprints of this year's Tour, today riding away from the field to take his 4th stage win of the 2008 Tour. It was clearly a day for the sprinters, but former French champion Florent Brard and Milram's Belgian track star Niki Terpstra spent most of the day in a breakaway that took top points at all the day's intermediate climbs and sprints. Milram, Liquigas and Columbia powered the peloton in the final kilometers, but the orderly leadout trains tangled up in the last 1000 meters, leaving a classic field sprint. Silence-Lotto's Robbie McEwen, who has been largely invisible so far this year, marked the Manxman's wheel in the final 200 meters, but just couldn't ramp up the horsepower to get by Cavendish. It's the 6th career stage win for Cavendish, just 22. 3. Romain Feillu, Agritubel, France, s.t. 4. Heinrich Haussler, Gerolsteiner, Germany, s.t. 5. Oscar Freire, Rabobank, Spain, s.t. 6. Thor Hushovd, Credit Agricole, Norway, s.t. 7. Leonardo Duque, Cofidis, Colombia, s.t. 8. Erik Zabel, Milram, Germany, s.t. 9. Julian Dean, Garmin-Chipotle, New Zealand, s.t. 10. Sebastian Chavanel, Française des Jeux, France, s.t. Freire will extend his gap on Thor Hushovd in the green jersey race, while Cavendish moves into a tie with Hushovd at 2nd. Niki Terpstra takes the aggressive rider red number for today's stage. The overall is unchanged, as well. That's the motto for today's stage, the first (but doubtful the last) won by Team Columbia's Mark Cavendish. Everybody and his brother thought today was a stage for Mark Cavendish. Team manager Bob Stapleton was even talking about whether his Team Columbia would be able to get help chasing down the breaks today. It's insanely difficult for a sprinter to pick his stage -- it's so easy for someone to grab his wheel, and slingshot by for the win at the line. But Cavendish delivered the win in a finish complicated by the catch, at 50 meters (!) of French champion Nicolas Vogondy, who spent all day in the break. 3) Erik Zabel, Milram, Germany, s.t. 4) Thor Hushovd, Credit Agricole, Norway, s.t. 5) Baden Cooke, Barloworld, Australia, s.t. 6) Robbie Hunter, Barloworld, S. Africa, s.t. 8) Robbie McEwen, Silence-Lotto, Australia, s.t. 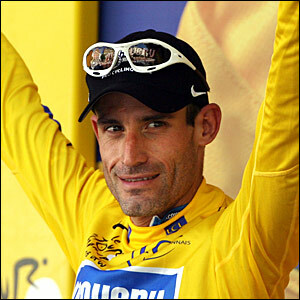 9) Francesco Chicchi, Liquigas, Italy, s.t. 10) Julian Dean, Garmin-Chipotle, New Zealand, s.t. There was essentially no change in the yellow, white, or polka-dot jersey competition, but Thor Hushovd takes over the green with his 4th on the stage. Out of the race today was Maurcio Soler of Barloworld. Gerolsteiner's Heinrich Haussler took a serious spill with less than 4 kms to ride, but finished the stage 6:30 behind Cavendish. Lampre's Daniele Bennati disrupted Tom Boonen's leadout train, taking a big pull from Sebastien Rosseler up to victory on the Champs-Elysees. Boonen was surrounded by the other green jersey hopefuls, and the leadout men were scrambled. Bennati found himself behind Rosseler, pulling hard, with about 250 meters to ride, and when Rosseler pulled off to his left, Bennati had an unimpeded line to the finish, and just hammered. Robbie Hunter went hard up the right, with Hushovd and Zabel in between, but it was Bennati on the line, ahead of Hushovd, Zabel, Hunter, and finally Boonen. It's Bennati's 2nd stage win after Stage 17. The slight loss of points won't take the green jersey of Boonen's shoulders, so he'll finish in the final points lead with 2 stage wins. Cadel Evans chose not to go hunting for bonus seconds, and he and Contador finished safely in the peloton, giving 24-year-old Alberto Contador his first overall Tour de France title. It's by far the closest Tour podium in history, eclipsing Stephen Roche's 1987 victory, where the 3rd-place rider, Jean-François Bernard, was 2:13 behind Roche. 4) Robbie Hunter, Barloworld, South Africa, s.t. 5) Tom Boonen, Quick Step, Belgium, s.t. 6) Sebastian Chavanel, Française des Jeux, France, s.t. 7) Fabian Cancellara, CSC, Switzerland, s.t. 8) David Millar, Saunier Duval, Great Britain, s.t. 9) Robert Förster, Gerolsteiner, Germany, s.t. 10) Manuel Quinziato, Liquigas, Italy, s.t. Contador becomes the first rider since Jan Ullrich in 1997 to take the white and yellow jerseys. Discovery Channel wins the team competition. Barloworld's Juan Mauricio Soler wins the King of the Mountains, and Euskaltel's Amets Txurruka was named the most agressive rider of the entier Tour. Tom Boonen takes his first career overall green jersey. It's another indicator of the arrival of a new generation of riders, as Contador, Soler, and Txurruka are 24, while Boonen is 26. Most commentators saw today's stage as a long breakaway or a sprint from a select group, with a 2nd-Category climb about 45 kilometers/28 miles from the finish. But things didn't follow the script. A long breakaway by Euskaltel-Euskadi's Amets Txurruka and Bouygues Telecom's Pierrick Fedrigo looked like it might stay away, but after the day's big climb, Lampre and Française des Jeux, both still seeking stage wins, powered the chase along a plateau and down into Castres. By the time Txurruka and Fedrigo were caught, just outside of 1 kilometer to ride, Quick Step was setting up the blue train for Boonen, peeling its riders off one by one, and keeping the pace high enough that no one could counter. Boonen came off of Gert Steegmans' wheel with around 200 meters to ride, and Erik Zabel and Robbie Hunter, trailing Belgium's former world champion, launched to either side of Boonen. Neither could match Boonen's finishing speed, and he took his 2nd stage win of the 2007 Tour. Boonen also pads his lead in the green jersey competition, where his 195 points lead Robbie Hunter's 175 and Zabel's 174, with Thor Hushovd a distant 4th with 132. 3) Robbie Hunter, Barloworld, S. Africa, s.t. 4) Daniele Bennati, Lampre, Italy, s.t. 5) Thor Hushovd, Credit Agricole, Norway, s.t. 6) Bernhard Eisel, T-Mobile, Austria, s.t. 7) Sebastien Chavanel, Française des Jeux, France, s.t. 8) Nicolas Jalabert, Agritubel, France, s.t. 10) Andrey Kashechkin, Astana, Kazakhstan, s.t. No significant changes to the overall standings. Stef Clement of Bouygues Telecom finished outside the time limit, after a crash at 35 kilometers. Stage 10 is a transitional stage. The peloton covers 229.5 kms/142 miles down to the Mediterranean town of Marseilles. Two 4th Category climbs in the first half and two 3rd Category climbs in the second half, with 2 intermediate sprints. Plenty of riders have marked themselves no danger to the overall standings, and can be allowed to get away in a breakaway today. Temperatures are in the high 90s. With 73 kilometers gone, a group of 10 strong riders bridged up, including former stage winners Jens Voigt of CSC, Patrice Halgand of Credit Agricole, Juan Antonio Flecha of Rabobank, and Cedric Vasseur of Quick Step. Also there are Andriy Grivko of Milram, Michael Albasini and Aleksandr Kuschynski of Liquigas, Burghardt of T-Mobile, Paolo Bossoni of Lampre, Staf Scheirlinckx of Cofidis, and Sandy Casar of Française des Jeux. The gap continues to climb for the breakaway, 7:50 with 101 kilometers to ride. At the feedzone, the 11 leaders have 10:10 on the field. The gap went out as high as 14:00, but has started to fall. It's now about 10:18 with 88 kilometers to ride. The 2nd intermediate sprint is a few kilometers up the road. The gap has hovered around 10:30 to 11:00; the peloton is content to have the day's winner come from these 11 breakaway riders. They've got two 3rd-Category climbs to shake up the group yet. On the first, Jens Voigt is first to attack, but he's easily matched, and the 11 ride together. Then Patrice Halgand launches, matched by Michael Albasini of Liquigas and Sandy Casar of Française des Jeux. Voigt was in a 2nd group, chasing with Burghardt, Cedric Vasseur, and Scheirlinckx, while Flecha, Bossoni, Kuschynski, and Grivko are farther back. Coming down, Voigt and Vasseur have joined the three leaders, and the other 6 survivors of the earlier break are riding together almost 35 seconds behind. On the day's last climb, Patrice Halgand launches a few tests, but nobody can get a gap to stick. Over the top, the 5 riders are all together, while behind, the chasers break into smaller pieces, with Burghardt chasing ahead of Scheirlinckx and Flecha. In the last 5 kilometers Voigt attacks and is matched, Vasseur attacks, matched by Albasini, then the others. With 2 kilometers to ride, they're all together. Voigt rides in 1st, with Albasini shadowing him, and Casar, then Halgand, then Vasseur offset to the side. It's a dead straight last kilometer, and they're through the flamme rouge. Nobody has been able to get a gap, so it looks like we'll get a 5-up sprint. Here's 400 meters, Vasseur shoots up the right at 250 meters, Casar is coming up fast, with Albasini on the left, and Vasseur is first to the line! My Tour Twitter feed is the best way to track updates in real-time. I typically will post a few dozen comments during each Tour stage, including more time gaps than I post here. Tom Boonen's reputation was suffering in this year's Tour, as he finished second to his leadout man Gert Steegmans in Stage 2, and couldn't quite close the deal in the other field sprints. With Thor Hushovd and Robbie McEwen nursing injuries, today was the last opportunity for Boonen to take a stage win until Wednesday's Stage 10. In an all-hands sprint into Bourg-en-Bresse, Boonen outkicked Rabobank's Oscar Freire and yesterday's green jersey, Erik Zabel, to retake the green jersey. Barloworld's Robbie Hunter jumped a little too soon, and '07 Tour sprint revelation Romain Feilleu was coming on strong at the line after waiting too long, but Boonen timed it just right. Only two riders left the shelter of the peloton today. Bradley Wiggins of Cofidis attacked after 2 kilometers and rode alone for 190 kilometers/115 miles, and at one point was the virtual race leader with a 17:00 gap to the field. Andrey Grivko of Milram briefly tried to join Wiggins, but quickly returned to the pack. It was clear that the sprinters had marked this stage on their race bible, as they pulled Wiggins back within 2 minutes and let him dangle, finally making the capture with only 7 kilometers/4.5 miles to ride. Boonen retakes the green jersey. In the overall, Freire gains enough bonus time to move ahead of George Hincapie, up into 5th overall. Gusev holds white, Chavanel holds the polka-dots, and Brad Wiggins gets the red race numbers (“most combative rider”) for tomorrow. A lot of riders on the list below won't be on the list below tomorrow night. Yellow jersey Fabian Cancellara showed brilliant tactical sense to take a beautiful stage win in Campiégne. A 4-man break of Stéphane Augé, Matthieu Ladagnous, Frederik Willems, and Nicolas Vogondy were being reeled in with less than a kilometer to ride, and Cancellara attacked out of the field as the peloton neared the foursome. Like a flash, the world TT champion was past the four and flying. The chaos of setting up their finish sprints, the chaos of the catch, and the sudden and vicious attack put the sprinters on their heels, and by the time they could wind it up to speed, Cancellara was out of reach for a dramatic win. It was Cancellara's 3rd career stage win, the first outside of a Prologue. Stéphane Augé takes over the King of the Mountains jersey from David Millar, and Cancellara extends his yellow jersey lead with the bonus time from the stage win. 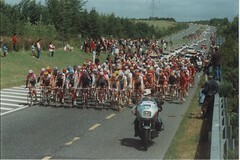 The story of the day is a late-stage crash, which took out a number of key riders with about 2 kms/1.25 miles to ride. It appeared a Milram rider pulled out of his pedal, slid out on the narrow road, and took a number of riders with him. Yellow jersey Fabian Cancellara went down hard, and riders filtered in for several minutes after the day's winners. Most of the sprint specialists were positioned in front of the wreckage, including Stage 1 winner Robbie McEwen, Tom Boonen, Erik Zabel, Oscar Freire, and Robbie Hunter. Quick Step had Tom Boonen's leadout underway before the crash, and they followed through almost to perfection. The team asked Steegmans, Boonen's final draft, to stay on the front longer than normal because of a finishing hill. Boonen then had trouble getting around his big Belgian teammate, and Steegmans led Boonen across the line for a Quick Step, and Belgian, 1-2 on the day. Afterward, Steegmans said if Boonen let him win, “it's the best present I have ever had,” Steegmans said. 3) Fillippo Pozzato, Liquigas, Italy, s.t. 5) Romain Feillu, Agritubel, France, s.t. 6) Robbie McEwen, Predictor-Lotto, Australia, s.t. 7) Erik Zabel, Team Milram, Germany, s.t. 8) Heinrich Haussler, Gerolsteiner, Germany, s.t. 9) Oscar Freire, Spain, Rabobank, s.t. 10) Sebastien Chavanel, Française des Jeux, s.t. UCI rules neutralize the effect of late crashes by giving everyone held up by the crash the same time as the winner, so there's no significant change in the overall standings. Boonen takes over the green jersey and moves up to 7th in the GC based on bonus time awarded for his 2nd on the stage. The Guardian reports that Cancellara's wrist is a “minor injury,” but that Lampre's Daniele Bennati was taken to a local hospital after injuring his hip in the crash. Over at ThePaceline.com (free reg. req. ), Cathy Mehl reports George Hincapie appears to be all right after lacerating his knee in the crash, and Tomas Vaitkus may have broken his thumb. Erik Zabel's Team Milram announced today that Zabel will continue to race for the team, despite admitting last week that he used EPO during the 1996 Tour de France, while racing for Telekom. Zabel won't be sanctioned for his admission, since the doping happened more than 8 years ago. 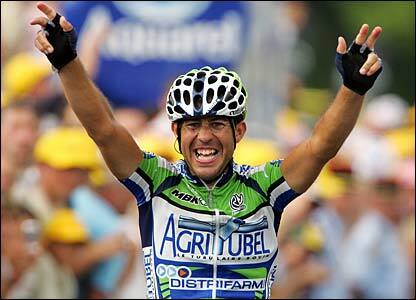 Zabel is a 6-time green jersey winner with 12 career Tour stage wins (two in 1996 -- Stage 3 and Stage 10). The biggest wins of the mid-90s Telekom team were the back-to-back Tour de France wins by Bjarne Riis in 1996 and Jan Ullrich in 1997. With the admissions by much of that squad -- Erik Zabel, Rolf Aldag, Udo Bolts, and others -- that they were using EPO and other banned substances throughout the period, it was harder and harder to believe the team leaders were riding clean. "My jersey is at home in a cardboard box," he said. "They are welcome to come and get it. I have my memories for myself." Riis had long suffered the nickname “Mr. 60 Percent” on the internet, a reference to a hematocrit that reportedly once hit a superhuman 64 (source: Telekom soigneur Jef D'Hondt, on Panorama), where 50 is the current legal limit. Riis said he was speaking out for his current team, CSC, where he is the team director, and where he said attention on his possible involvement in doping while racing was an ongoing distraction. The team, he claims, is completely behind him. It's time to kick off the year's 3rd grand tour, and it feels more like the 15th round of a prizefight. Even though all riders passed their pre-Vuelta blood screens, one rider will miss the start over doping concerns. Saunier Duval-Prodir has dropped their Vuelta leader Koldo Gil on a belief that he's implicated in Operación Puerto. It apparently results from his days with Manolo Saiz and Liberty Seguros, but Saunier Duval's Joxean Fernandez told AS (in Spanish) “we don't want to take any risks over a potential problem that has nothing to do with us.” Gil rode strongly at the Tour of Switzerland, coming second to Jan Ullrich. Caisse d'Epargne's Alejandro Valverde, back from a broken collarbone at the Tour de France, is the race favorite, with Tour winner-in-waiting Oscar Pereiro as his superdomestique. CSC's Carlos Sastre has never met a grand tour he didn't like, as he takes the start of his 5th consecutive GT, last missing the 2005 Giro. Conversely, Alexandre Vinokourov wasn't allowed to start the Tour in July, but Astana (who has signed to use BMC's funky Swiss carbon-fiber frames now that Phonak is leaving the sport) will have a full squad backing Vinokourov in the Vuelta, while wrangling continues over the future of the team's ProTour license and management. Best hope for the United States is Tom Danielson of Discovery Channel, riding his first GT as the undisputed team leader. Danielson, 28, talked with Andrew Hood of VeloNews about his Vuelta hopes. Milram's Alessandro Petacchi is back to racing, but poormouthing his Vuelta chances, tapping teammate Erik Zabel for the sprinter's jersey. Robbie McEwen looks to join Petacchi as the 4th rider to win multiple stages of all 3 GTs in a single year -- Petacchi in 2003 as well as Miguel Poblet in 1956 and Pierino Baffi in 1958 are the others. Reigning Vuelta champ Denis Menchov, who won the race when Roberto Heras tested positive for EPO and was stripped of the title, says the Vuelta was his “secondary objective” behind the Tour, and he doesn't “feel as sharp and this affects you physically as well.” Menchov's Rabobank squad won't be distracted trying to set Oscar Freire up for wins, as Freire pulled out earlier this week, citing a neck injury. The TV coverage is debuting a “seatpost camera,” that will mimic the rear-facing cameras used in NASCAR, and rotate among riders daily. Also new will be in-car cameras for interviews with team directors. On the other hand, the Vuelta will dispense with publishing heart rate monitor data, since most teams wouldn't allow their key riders' data to be published. In the US, to see the coverage, you'll have to subscribe to Cycling.TV's web streaming feed. Nothing says “wide-open Tour” better than lightly regarded Cyril Dessel of AG2R, who leads the world's biggest bike race halfway through. Wildcard Agritubel's team leader, Juan Miguel Mercado, sat in for the last part of the stage, and just barely nipped Dessel after a very long breakaway. T-Mobile spent almost the whole day at the front of the chase, but their yellow jersey, Sergei Honchar, fell off the pace at both the day's big climbs. He finished in the main group, as did Landis, Hincapie, Moreau, Evans, and, after struggling on the Marie Blanque, Leipheimer, Fothen and Simoni. One surprise was Iban Mayo; he came in with the grupetto 24:24 back. Tom Boonen was denied again, as Gert Steegmans launched Robbie McEwen like a booster rocket today straight up to his 3rd stage. Boonen was in perfect position for the sprint, trailing a couple of leading teammates coming up the left side of the road, with the field stretching out behind him. But the field sprint launched before he did, swamping Boonen and holding him against the rail, so that by the time he kicked hard, he had to work through traffic to finish 3rd. Boonen retains the yellow jersey, but honestly might just as soon be rid of it, and he will be tomorrow night. Tomorrow is the first long time trial of the Tour, where we'll finally separate the pretenders and contenders. I think that will make for better organized sprints on Sunday and Tuesday (rest day Monday), as it's likely one team will be defending the yellow jersey, and others trying to set up the sprint, instead of QuickStep doing both, as we've had the last couple of days. Wednesday, the race hits the mountains. 3) Tom Boonen, QuickStep, s.t. 4) Bernhard Eisel, Française des Jeux, s.t. 5) Thor Hushovd, Credit Agricole, s.t. 6) Oscar Freire, Rabobank, s.t. 7) Erik Zabel, Milram, s.t. 8) Luca Paolini, Liquigas, s.t. 9) Gert Steegmans, Davitamon-Lotto, s.t. 10) Inaki Isasi, Euskaltel-Euskadi, s.t. Rabobank's former world champion Oscar Freire launched a perfect sprint to win the Tour's Stage 5. Freire uncoiled from about 12th place in the field at about 250 meters to go, put on an incredible burst of speed up the right side of the road, then just kept his head down to the line, as current world champion Tom Boonen couldn't close him down. Euskaltel-Euskadi's Inaki Isasi takes 3rd, for what must be Euskaltel's earliest stage podium in a recent Tour. Usually, you only see them pacing crashes and flats back into the field until the mountains start. Boonen pads his lead, by virtue of the 12 bonus seconds for 2nd. A few other GC changes, as misfortune claims Egoi Martinez, and Freire powered to the podium, sitting 3rd, for now. Dollars to donuts Dumoulin will be the most combative rider, by virtue of being a Frenchman in a suicide break. 3) Inaki Isasi, Euskaltel-Euskadi, s.t. 4) David Kopp, Gerolsteiner, s.t. 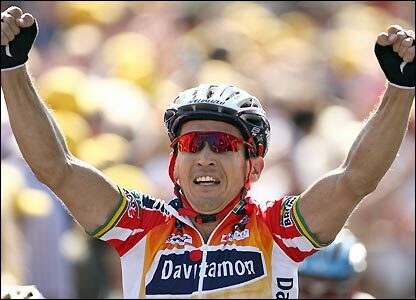 5) Robbie McEwen, Davitamon-Lotto, s.t. 6) Alessandro Ballan, Lampre, s.t. 7) Thor Hushovd, Credit Agricole, s.t. 8) Francisco Ventoso, Saunier Duval, s.t. 9) Bernhard Eisel, Française des Jeux, s.t. It looked like the sprinters would be denied today, as T-Mobile's Matthias Kessler put 14 seconds into the field over the day's final uncategorized climb. But the field wound it up, and caught Kessler within coasting distance of the line. Like a cobra, Robbie McEwen struck to take his first Tour victory of the year. Tom Boonen was 2nd on the day, off camera (bad OLN), ahead of Thor Hushovd and Rabobank's Oscar Freire. "The most important is to win a stage, then it's about winning a second. Then it's the fight for the green jersey. I have lost the green jersey twice in my career. This year I want to take it. Another stage is the priority, but I'm determined to take the green home." Thor Hushovd takes back the yellow jersey, as the sprinters move up the GC as a result of sprint bonus seconds. David de la Fuente, away for 200-odd kilometers, takes over the King of the Mountains jersey and was named the stage's most combative rider, which means he'll ride with red race numbers tomorrow. There was a late crash that involved a large fraction of the field, right at 2 kilometers to go, reportedly including Floyd Landis, but no one seems to know if he went down, or was just caught behind it (Yahoo! Sport has a picture of Lampre's Patxi Vila being treated afterward). All those riders will get the same time at the finish as the leaders. Race leader Thor Hushovd was taken away in an ambulance at the end of Stage 1 in Strasbourg. It appeared that Hushovd, sprinting right along the right edge of the road, caught a fan's hand-shaped poster, cutting his arm with less than 50 meters to race. It was a chaotic sprint, and favorite Tom Boonen went too soon, and couldn't go top 10 (cyclingnews.com says Boonen may also have hit a fan). Robbie McEwen switched off wheels from Hushovd to Boonen, and as he does, appeared in the thick of it at the last instant, but he waited a touch too long, and the French got their first stage win of the year: Jimmy Casper of Cofidis, who edged McEwen and Milram's Erik Zabel. Discovery Channel's George Hincapie takes the race leadership, after a cagey attack for an intermediate sprint that gave him 2 seconds bonus, against the possibility that none of the riders near the top of the GC competition would take bonus time from a top-3 finish on the day. 3) Erik Zabel, Milram, s.t. 4) Daniele Bennati, Lampre, s.t. 5) Luca Paolini, Liquigas, s.t. 6) Isaac Galvez, Caisse d'Epargne, s.t. 7) Stuart O'Grady, CSC, s.t. 8) Bernard Eisel, Française des Jeux, s.t. 9) Thor Hushovd, Credit Agricole, s.t. Wegmann takes the first (cheap) mountains jersey, while Vaugrenard, involved in a long break where he took some bonus time, takes the young riders' white jersey. Oscar Freire took a shortcut to a stage win on Friday. Freire survived a 20-rider break that went off around the 50-kilometer mark, along with Matthew White of Discovery Channel. T-Mobile's Michael Rogers and Lampre's Salvatore Commesso were in a six-man group that bridged up shortly later. Commesso and Rogers went off the front at 12 kilometers to ride, and Freire and White bridged 5 kilometers later, to create a high-quality break, with Commesso notably avoiding any work. Then, with only about 5 kilometers to ride, and Davitamon-Lotto and QuickStep driving the peloton nearer and nearer, Freire bunny-hopped up onto and across a median as the break took the long way around a divided highway. By the time the break went right, straight, and back to the left to join the lane Freire had followed, the triple world champion had 5 seconds on the trio, and rode all out to the line. His breakmates were absorbed in the last kilometer, and the peloton was breathing down his neck, but Freire took the win, with just enough time in hand to zip his jersey. Daniele Bennati, Erik Zabel, and Sebastian Hinault led in the field 3 seconds back. Sixteen riders exited the race today, with Michael Rasmussen not taking the start, and Paolo Bettini, Robbie McEwen, Marco Velo, and Dario Cioni, among others, not finishing. Six Team LPR riders exited, leaving only Mikhaylo Khalilov in the race for the Italian squad, which was apparently hit by il virus intestinale. There was a gap in the field, so Koldo Gil lost 4 seconds from his lead in the overall. In Baden, Tom Boonen showed his stuff, outsprinting Lampre's Daniel Bennati and Rabobank's Oscar Freire for his 17th win of 2006. Two other strong sprinters, Milram's Erik Zabel and Davitamon-Lotto's Robbie McEwen, were dropped on a 4th category climb on the last finishing lap. Because of time bonuses, Boonen leads Bennati by 4 seconds, and Liquigas' Michael Albasini by 5 seconds in the overall classification. Cycling4All offers a final Tour de Suisse start list. Of course, Jan Ullrich is the biggest Tour GC threat at the race, starting today, but there are a lot of other Tour players involved. Top sprinters Tom Boonen and Robbie McEwen are here, and are the favorites for the Tour's green jersey this year. Thousand-time (okay, six-time) green jersey Erik Zabel is here, as well, leading Team Milram. Others in competition: Michael Rasmussen, Paolo Bettini, Cadel Evans, Fabian Cancellara, Michael Rogers, Oscar Freire, and Bradley McGee. Web streaming coverage is available from Cycling.TV's premium subscription service, where £19.99, or about $37, gets you a full year of racing. Today and tomorrow, subscribers have both the Dauphiné Libéré and the Tour de Suisse to choose from. Levi Leipheimer is back in Europe for the Tour of Catalonia (aka the Volta Ciclista a Catalunya). A number of other 2006 Tour likelies will also take the start, including Phonak's Santigo Botero, Rabobank's Denis Menchov, T-Mobile's Giusepe Guerini, CSC's Fabian Cancellara and Stuart O'Grady, Cadel Evans, Francisco Mancebo, Inigo Landaluze (fresh from an overturned suspension), Thor Hushovd, Erik Zabel, and Filippo Pozzato. Today's stage is a short time trial, 12.6 km (about 7.5 miles) in length. Update: VeloNews reports this morning that, in pre-race blood tests, former Liberty Seguros rider Jan Hruska of the Czech Republic, now riding for 3 Molinos (sponsored by The Wallflowers?) failed his hematocrit and is barred from racing for 2 weeks. With Paris-Nice and Tirreno-Adriatico out of the way, we can look forward to La Primavera, Milan-San Remo, the first classic of the year, running this Saturday in Italy. It's the longest of the classics, at more than 180 miles and about 7 hours in the saddle. Last year, Alessandro Petacchi finally took his first win in San Remo, ahead of Danilo Hondo (and whatever became of him?) and Thor Hushovd. In 2004, Erik Zabel timed his sprint perfectly, and looked to have his 5th Milan-San Remo locked up, only to sit up early and lose to Rabobank's Oscar Freire. Over at the International Herald Tribune, Samuel Abt handicaps the 2006 edition of the race. The obvious favorites are Petacchi and Tom Boonen, both of whom are winning sprints seemingly at will this year. Both of them have some extra baggage, their teammates Zabel (with Petacchi at Milram) and Paolo Bettini (with Boonen at Quick Step), who won the race in 2003. "I'm going to start the race on Saturday and then worry about getting to San Remo," he added on Tuesday ... "My back and my knee still hurts when I stand on the pedals but I'm optimistic things will improve," he said ... "Unfortunately, Milan-San Remo is the longest race of the season. I just hope my back and knee don't hold me back during the final part of the race." Boonen toured the race finish Monday. If he could win here, he would be just the 5th man to win the race while world champion. Even so, he's my pick. Quick Step's triple world champion Paolo Bettini is 2-for-2 at Tirreno-Adriatico, after a 2nd stage win in Frascati on Thursday. "I'm not thinking about the general classification, I'm taking things on a day by day basis. Tomorrow's stage is one that I have already won twice, in 1999 and 2003. We'll have to see if I can make it three." Bettini closed almost 30 seconds on Daniele Contrini in the last 2 kms, passing him in the last 500 meters and outsprinting Milram's Erik Zabel (again). It was Zabel's 9th 2nd-place on the young season. LPR's Mikhaylo Khalilov was 3rd. That's how the overall shakes out, so far, since both stages had the same 1st and 2nd-place riders. Stuart O'Grady, now riding for CSC, was victim to a pothole, and broke five ribs and his collarbone. Paolo Bettini seized the day, saying he's intent on competing for the overall title at Tirreno-Adriatico. "The only way we could win was to make Quick.Step work because we knew that Paolo (Bettini) was the man to beat. In any case, Erik rode great today. With 1km to go, he was a bit behind and came up fast. Yes, he lost, but he lost to Bettini who is the best in the world for this kind of finish. So I'm willing to do what it takes to help my teammate win." "I'm not going to hold back. This year's route is tough. The stage five time trial and the uphill finish at San Giacomo on stage six will decide the race," Bettini said. "Levi Leipheimer and Stefano Garzelli are the big favourites but I've thrown my hat into the ring and I'm going to give it a go." Longtime Lance Armstrong nemesis Filippo Simeoni took a very long flyer today, jumping out with only 4 kilometers ridden, being joined soon by two other riders, dangling almost 10 minutes off the front, then being caught with less than 3 kilometers left on the stage. Southern Europe's fastest man took the win at the Tour of Lucca today. Alessandro Petacchi led Claudio Corioni over the line, followed closely by Petacchi's new super-leadout with Italy's Milram, former T-Mobile sprinter Erik Zabel. The German news magazine Der Spiegel talked to Tour 5-time winner Eddy "The Cannibal" Merckx about the 2005 Tour, Ullrich vs. Armstrong, and where Armstrong will rank on his retirement at the end of next week. SPIEGEL: The T-Mobile team, even without Zabel, is full of elite riders. 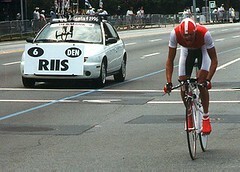 Supporting Ullrich is Andreas Kloeden -- who was second in 2004 -- and Alexandre Vinokourov -- who was third in 2003. Armstrong has to pay attention to all of them and has to chase down every attack. Couldn't they wear him down if they take turns being aggressive? Merckx: No. If Vinokourov beats Armstrong by three minutes one day and then loses them again the next day because Kloeden goes on the attack, it doesn't bother Armstrong at all. In the end, it all comes down to Ullrich beating Armstrong in the mountains in a man to man battle. That is difficult enough. It's perhaps understandable that T-Mobile's Erik Zabel, six time winner of the Tour de France sprinter's jersey, would be unhappy about being left off the team's Tour squad this year. He's speaking out about the decision and team leader Jan Ullrich. A little more surprising is that Andreas Klöden, who last year stormed to the German national championship and 2nd overall at the Tour, is also sniping at Ullrich. "I asked to be released too. I would have loved to stay away from this championship," Klödie moaned. "Other people were allowed to". Klöden rode the 204 km race in Mannheim with little conviction, coming home in 57th place, 38 seconds off the pace. Adding insult to injury for Zabel, the team will be running him in the Tour of Austria starting July 4th, which means he won't be able to cover the race for German TV during the Tour's first week. "I wouldn't have prevented him from winning," vouched six-time green jersey winner Zabel. "When I become second or third it is a loss, yet other people are celebrated for that." Ouch! Zabel's room-mate Rolf Aldag - also not included in T-Mobile's final nine - has joined the fray, claiming: "I would have left it up to a champion like Erik to decide whether he wanted to start or not." This is a very experienced Tour squad, with stage wins by Ullrich (6 in all), Vinokourov (in 2003), Guerini (in 1999), and Nardello (in 1998), and the 2001 white jersey win for Sevilla. One or another of their riders has come 2nd at the Tour 6 times since 1996, with Klöden second last year, and Ullrich won the overall in 1997. Only Schreck is making his first Tour start. Removed from the preselection were Rolf Aldag, Sergei Ivanov, Paco Lara, and Bram Schmitz. The big surprise of the preselection was that it lacked Erik Zabel, who has won the Tour's green sprinter's jersey 6 times. Six-time green jersey winner Erik Zabel will not start his 12th Tour de France this year. "It is as tough a decision for us as it is for Erik. With six green jerseys and twelve Tour stage wins, he has left his mark on the Tour like hardly any other German rider," said the future team manager Olaf Ludwig. "But with three riders in the team, who already stood on the podium in Paris (Klöden, Ullrich, Vinokourov), we are clearly aiming for yellow." For the departing team manager Walter Godefroot it is also "a new situation to compete at the Tour without Erik." However, Zabel would accept the decision of the team management, "since he is a pro to the core." Zabel has reached an age where he's not producing many wins anymore, and his odds of factoring heavily in the green jersey competition would have been pretty low, I think. Still, it's strange to imagine a TdF without him. They'll make a final team presentation on Wednesday, June 22. Alessandro Petacchi took his third stage win of this year's Giro today, ahead of T-Mobile's Erik Zabel and Quick Step's Paolo Bettini -- certainly the best 3 sprinters left in this year's Giro. It was Petacchi's 18th career Giro victory. As you would expect, Discovery Channel's Paolo Savoldelli retains the overall race lead. A hard-fought sprint at the line today left Baden Cooke with nowhere to go but into the barricades (shades of Djamolodine Abdoujaparov) and initially gave the pink jersey, Quick Step's Paolo Bettini, a second stage win. After discussion among the judges, Bettini was "relegated" from the final sprint, and given the field's time. That won't endanger his maglia rosa, but it gives the day's win to Luca Mazzanti of the Panaria team, which has a second stage win to go with Brett Lancaster's prologue victory. Mazzanti also leapfrogs into 3rd overall, behind Bettini and Danilo Di Luca. Cooke had told Eurosport he was worried about "tricky finish" of Stage 4. Basso, Simoni, Cunego, Garzelli, and even many of the sprint specialists (including Petacchi, Zabel, O'Grady, and McEwen) finished in the main field, but Discovery Channel's Paolo Savoldelli, who won the Giro in 2002, lost about 40 seconds on all the other GC contenders. Savoldelli sits 29th overall, at 1:09 from Bettini, and trailing his Discovery teammate Volodymyr Bileka by 5 seconds. Former Tour de France contender Joseba Beloki, who has never returned to top form after his crash in the 2003 Tour, finished at 1:18 behind Mazzanti, and sits more than 10 minutes back overall. You can check out the action from Stage 3 at GrahamWatson.com or cyclingnews.com, or by clicking through any of the thumbnails shown here. Watson got a good shot of the T-Mobile team, which he says is working for Zabel this year. It's a shame they couldn't get him up into the break Tuesday. He also chronicled Robbie McEwen's first career day in the maglia rosa, and got a couple of good shots of Australian Russell Van Hout, who was Stage 3's suicide break. Watson is also offering a print of the landscape/rider picture that's first at right. VeloNews.com | Bettini e buonissimo! QuickStep's Paolo Bettini found Stage 1 of the 2005 Giro suited him perfectly. Bettini made a move in the last kilometer of the race, where the course came to a short steep uphill. It was a trademark Bettini move, and Alessandro Petacchi's Fassa Bortolo squad wasn't able to respond in time to reel in the 2004 Olympic road race champion. Coming up to the line, Lotto's sprint specialist Robbie McEwen showed he's back in terrific form after an early-season flu led him to skip the spring classics, as he put a second into Petacchi and took 2nd on the day. Petacchi, who took 9 stages of last year's Giro, was 3rd, followed by Baden Cooke and Manuele Mori. It was Bettini's first-ever Giro win, and he'll wear the maglia rosa for the first time. Discovery's Paolo Savoldelli finished with the leaders, and sits 4th overall, 22 seconds behind Bettini, and 3 seconds ahead of Lampre's Cunego. Ivan Basso finished at 9 seconds today. Time for the annual Gilberto Simoni drama-fest, as he and Cunego slug it out for the overall, and leadership of their own Lampre team, all over Italy. Time, of course, for the Giro d'Italia. Of course, the last few Giros have also seen the emergence of Alessandro Petacchi, whose Fassa Bortolo blue train has placed him perfectly for so many sprint wins. Potentially adding to the sprint drama this year is T-Mobile's Erik Zabel, who believes that some of this year's stages will be hard enough to neutralize Petacchi, and give Zabel (and teammate Olaf Pollack) a shot at a stage win in a select group. Over at CSC, Ivan Basso has said he's riding for the Giro-Tour double, and raring to go. CSC will be riding two Americans, Dave Zabriskie and Christian Vande Velde, in Basso's support. Discovery Channel will finally get a real look at new team member Paolo Savoldelli, who won the 2002 Giro, and has a reputation for finishing long tours strongly. Tony Cruz, Tom Danielson, Jason McCartney and Michael Barry are coming off April's Tour de Georgia. The Daily Peloton has individual pieces on each squad, looking at who's got a shot at the overall, who will be fishing for stages, and who's just killing time. Erik Zabel will ride in his first Giro d'Italia, starting Saturday. On Sunday, Zabel won the 'Rund um den Henninger Turm' for the third time, marking the second win (after Vinokourov's Liege-Bastogne-Liege) for T-Mobile this year. Tom Boonen won perhaps the biggest race of his stellar career Sunday, and established himself as more than Belgium's outstanding sprinter in a dramatic win at the Tour of Flanders. At the first Belgian classic of the year, Boonen animated a six-man breakaway group, then rode away from a class bunch, including two-time Flanders winner Peter Van Petegem, Erik Zabel and his T-Mobile teammate Andreas Klier, Fassa Bortolo's Roberto Petito, and Lampre-Caffita's Alessandro Ballan, the only survivor of an earlier break, to which the strongmen bridged with less than 40 kilometers to ride. Instead, Boonen countered one of Van Petegem's attacks, and immediately got a 10-second gap on the breakaway, which pretty quickly started racing for second, letting Boonen win by 33 seconds. Team Discovery Channel has to be a little disappointed. Lance Armstrong flew the flag in a late but futile chase of the leaders, and George Hincapie, Stijn Devolder, and Viatcheslav Ekimov were in the chasing group in the last 10 kilometers, but none of the Discos covered Boonen, van Petegem, and Zabel's decisive move. Hincapie led the field sprint, taking 7th on the day, but that's small comfort. CyclingNews has Johan Bruyneel telling "Belgian TV tersely that 'for the team, it was a big disappointment.' "
TDFBlog favorite Magnus Backstedt was in the longest break of the day. When I saw procycling's story, I thought a disaster had befallen last year's Milan-San Remo winner, Oscar Freire, coming off a victory and three stage wins at Tirreno-Adriatico, and he wouldn't be riding Saturday. Turns out, he's been told he can't wear his rainbow jersey, representing his current world championship, because his win at Tirreno-Adriatico vaulted him into the lead of the UCI ProTour competition. Since the UCI sets the rules, the white jersey awarded to ProTour leaders has precedence over the rainbow (as the rainbow takes precedence over national championship jerseys). Even the UCI's road racing coordinator admits the situation is "not ideal:"
Their picks: Freire, of course; Paolo Bettini, who won in 2003; Erik Zabel, who should be out for blood after blowing last year's race at the line; Alessandro Petacchi, who may not have the gas for a race this long; and Australia's Allan Davis of Liberty Seguros. Jan Ullrich is said to be in better shape than last year at this time, Andreas Klöden and Alexandre Vinokourov are still on board, and now they've hired Oscar Sevilla from Phonak and Olaf Pollack from Gerolsteiner, to support Erik Zabel, whose final sprint is starting to grow less fearsome. "When we've got three cyclists aiming for a top-three finish there's only one objective - and that's to win the Tour." "The Tour is the race I want to win," said the T-Mobile rider, who has finished runner-up five times but could only manage fourth in 2004's event. "I'm in training to be the best in the world and I want to once again prove something to myself." During T-Mobile's official team presentation today, the company announced that it will extend its sponsorship by two years, through 2008. Assuming Robbie McEwen survives the TT up Alpe d'Huez tomorrow, where can his pursuers make up points to take the green jersey away? Stage 16 and 19 are time trials, so no points are up for grabs. Stage 20 is flat, and suits McEwen well; no one is going to build a big point differential on the stage to Paris. Stage 17 is the last leg-breaker of the Tour, with an hors category, three 1st category, and a 2nd category climb. There's an early (9 km in) sprint, and one just before the last climb of the day, where Zabel or O'Grady are more likely to score than McEwen. Unfortunately for the sprinters, the finish of Stage 17 is only 13 kms down from the top of the 1st category Col de la Croix Fry. So Stage 18 looks crucial from here. The biggest climb on the day is the 2nd category Col de la Faucille, after the 1st intermediate sprint. From there, it's mostly downhill to the finish, but with two 3rd category climbs before the 2nd intermediate sprint that might enforce a break in the peloton. It is the stage that could completely turn the battle for the Maillot Vert, with the category 2 Col de la Faucille likely to be crucial. If O'Grady or Zabel make it over with the front group, and McEwen and Hushovd don't, whoever crosses the line first could grab all the points and put himself into green. VeloNews predicts Petacchi for this stage. I'm predicting that won't happen. The start town, St. Léonard, is the hometown of Raymond Poulidor, the "eternal second" who was 2nd 3 times, and 3rd 5 times in 14 Tours. 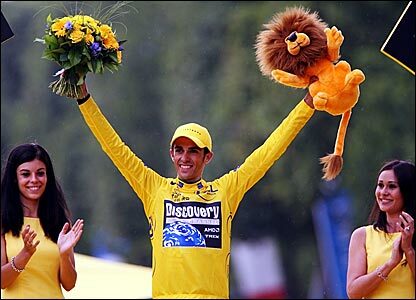 He NEVER WORE the yellow jersey, even for a day. With the race for green so close, I doubt the sprinters' teams will let a break stay away, so look for a field sprint to the line, and so far, it's looked like Robbie McEwen is the flat-out fastest man in the race. Jakob Piil is in the red race numbers. Again. This year, Tour organizers will award an overall combativity award, but not until Paris. Piil's the early nod — he's never met a crazy flyer he wouldn't take. Jean-Patrick Nazon takes the stage, his 2nd career stage after winning on the Champs Elysees last year. McEwen of Lotto will take his first career yellow jersey from Thor Hushovd, caught behind in the day's deciding break, along with Iban Mayo, Christophe Moreau, and Francisco Mancebo, among others. Lance Armstrong slips another place, to 5th, 16 seconds off the lead, but it was a good day for the 5-time winner, as several rivals finished 4 minutes back. Mayo was 3:53 back in 151st, Christophe Moreau 3:53 back in 114th. Bradley McGee is still suffering, coming in 9:06 back in 173rd. It will be a good race tomorrow, as a few riders have a shot at the yellow jersey after the team time trial; the top of the GC board is still tight enough that a very strong team time trial could drop the jersey on 10 different riders, but the best bet has to be Armstrong, only 7 seconds back of Jens Voigt, the only rider leading him with a good time-trialing team. Bassed on his record Giro d'Italia, Alessandro Petacchi has taken over the lead in the UCI world rankings. Jumping from number 227 all the way to number 6 is Damiano Cunego, who jumps ahead of Lance Armstrong through his overall Giro victory. Erik Zabel is a tiny 15 points back of Petacchi, with Quick Step's Paolo Bettini another 56 points behind Zabel. Jan Ullrich cracks the top 10, based on his Tour de Suisse win, and Tom Boonen jumps from 90 to 12.
Who will wear the green? Eurosport offers a preview of this year's green jersey competition. One of the major races within this race will be Alessandro Petacchi's efforts to survive the mountains without being eliminated for going over the time limit. If he can survive the full Tour, he has to be the favorite for the sprinter's jersey, based on his record 9 stage wins in this year's Giro. This has been an Australian stronghold the last few years, with Baden Cooke winning in 2003, Robbie McEwen taking 2002, and Stuart O'Grady factoring in the green jersey competition the last few years, holding the jersey until the last day of the 2001 Tour. Other sprinters to watch: Tom Boonen (Quick Step), Thor Hushovd (Credit Agricole), and 6-time green jersey winner Erik Zabel. T-Mobile announced the squad that will try to deliver a 2nd Tour de France win to Jan Ullrich. As Cadel Evans had previously announced, he's not on the squad, with Sergei Ivanov taking the spot some had set aside for Evans. Given the news lately, it's worth noting that Ivanov was dropped from the 2000 Tour for a too-high hematocrit.